Captain Shane Keogh reads a copy of the original 1916 Proclamation of Independence at the GPO today, to mark the 96th anniversary of the 1916 Easter Rising. EVERY EVENING, TheJournal.ie brings you a round-up of all the day’s main news, as well as the bits and pieces you may have missed along the way. 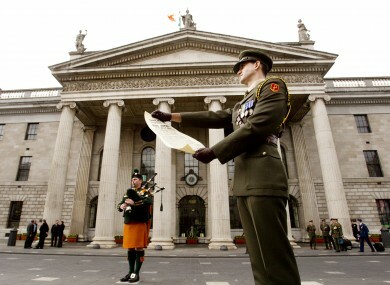 Events have been held around the country to mark the anniversary of the 1916 Easter Rising. The main event was held in Dublin, with President Michael D Higgins and Taoiseach Enda Kenny in attendance. In Glasnevin, a ceremony was held to commemorate Peadar Kearney, the composer of the National Anthem, and Edward Hollywood who created the first tricolour. Justice minister Alan Shatter took time before the event to share his frustrations that the investigation into criminal behaviour in Ireland’s banks has taken so long – in an apparent snipe at a cabinet colleague. Shatter’s statement appeared to be a response to Pat Rabbitte’s Sunday Independent interview in which he expressed frustration at how long the investigations were taking. Bertie Ahern says he has always got on well with the Irish people, and that it’s the media and some politicians which are keen to see him “under threat”. The former Taoiseach gave an interview to today’s Irish Sun. A seventh resident of a private nursing home in Co Donegal has died from the flu. The HSE says all residents at the Nazareth home in Buncrana are being given either active or preventative treatment. Michael Noonan is examining whether to extend tax credits for the film industry to the video games industry, in a bid to stop the UK from luring the industry to its shores. The trade union representing secondary school teachers says the government will need to increase the number of secondary school teachers by about 3,000 in the coming years, in order to cater for the growth in population. President Michael D Higgins lays a wreath at the ceremony in Dublin to mark the 96 anniversary of the 1916 Easter Rising. Photo: Leon Farrell/Photocall Ireland. As a great cartoon character once said, “Yakkety schmakkety, blah blah blah.” Thankfully, Hugh O’Connell’s selection of the week in quotes is far more inspiring. Yet another busy day on the sporting field, where Ulster overcome Munster in a Thomond thriller to qualify for the Heineken Cup semi-finals. They’ll play Edinburgh, while Leinster will travel to France to meet Clermont Auvergne who beat Saracens today. In gaelic games, Dublin missed out on a place in the National Football League semi-finals after a single-goal loss to Cork. Here’s our guide to the day’s results. A busy day in soccer too – where Manchester United took a giant leap towards their 20th title with a 2-0 win over QPR (thanks in part to some generous refereeing) while a late strike from Mikel Arteta gave Arsenal a 1-0 win against Man City. United are now 8 points clear in the league with six games to play. They’re not-quite-Easter Eggs, but here’s 29 features of the iPhone and iPad operating system that you might not have known about. Heard the one about the general election candidate who’s demanding that he be prosecuted? Malawi’s got a new president – only the second female head of state in modern African history.